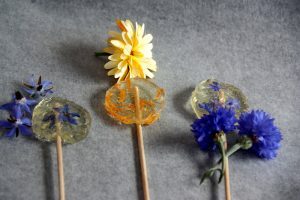 Today I want to share with you a fun way to use edible flowers: Gourmet Flowers Lollipops! If you are looking to make some gorgeous and tasty candy here is the recipie. 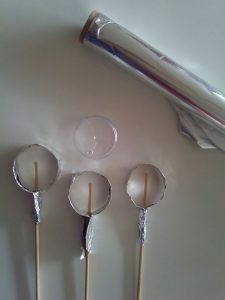 If you do not have molds for your lollipops you can easily make some with tin foil. First, cut a strip of tin foil and then fold your strip lengthwise 3 or 4 times, until you have a more narrow and firm strip. Find something to use to mold your strip, a round object with a diameter of about 3 cm, wrap your strip around it and pinch it tight, leaving room to insert the stick. Make another strip of tin foil to hold the stick of the lolllipop in place. Put the stick into the mold and wrap the new strip of tin foil around it. Lay your molds on a sheet of tin foil. 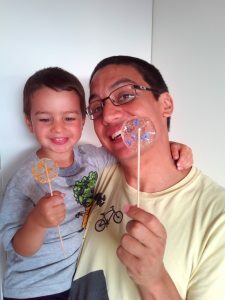 Now everything is ready to make the lollipos. Mix together in a pot sugar, water, and corn syrup over medium heat. Stir until sugar is dissolved. Cook the mixture until it reaches 150 degrees, which is the hard crack stage. It is important to work quickly form here to be able to use the mixture before it hardens. Be vary careful now not to burn yourself! Take off the pot from the heat and add quickly flavors to you mixture. 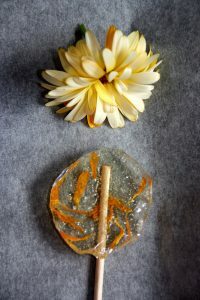 Pour some candy mixture into a mold, then place a few edible flowers over the top. 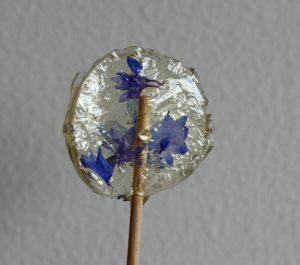 You can use a toothpick to push the petals inside the candy. Now you just need to wait for them to cool down. After a couple of hours carefully remove them from the mold, they are ready! 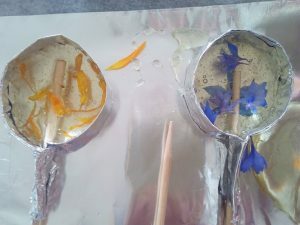 Grow your own flowers to make lollipops and other tasty recipes with our kit Grow your Gourmet Flowers and follow us on facebook to find workshops and new ideas!